My landscape painting is inspired by light and space. What first draws me to a scene is usually the way in which the light plays about a mountain top or upon the branches of a tree. But underlying that first impression is always the mystery of the horizon and how best to capture the vast sense of space so intrinsic to painting mountains and seascapes. Born and raised in Detroit, I relocated to Southern California in the 1970s and have resided here ever since. My transition from the Midwest to the Southwestern environment has had a profound effect upon how I approach the landscape as an artist. Where once my horizon line extended no farther than a city block, the mountainous region in which I now live presents me with on-going artistic challenges, as well as a desire to engage the viewer in feeling the same sense of grandeur as I myself feel. Although art-making has always been an intrinsic part of my life, I came to painting relatively late after careers in public administration and teaching. My formal art training took place at Mt. San Antonio College in Walnut, California, and at Ohio University in Athens, Ohio. Beginning with oil paint, I soon discovered the conveniences and pleasures offered by soft pastel. 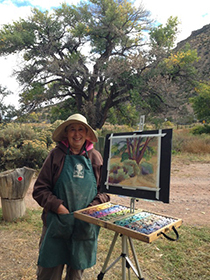 It has been my pleasure to have trained with some of the finest pastel and plein air painters in the field: Richard McKinley, Kim Lordier, Maggie Price, Lorenzo Chavez, Bill Cone Teri Ford, Ada Pissaro, Donna Yeager, and Sally Strand. I paint in the tradition of 20th Century realist plein air painters, with about 50 percent of my work executed from my own photographs viewed on a monitor in my studio. My professional affiliations include The California Art Club, Pastel Society of Southern California, Plein Air Artists of Riverside, and the Artist Guild of the Huntington Gardens. 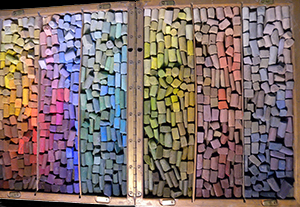 Unlike chalk, which is composed primarily of calcium carbonate, soft pastel is pure pigment the same properties contained in the wet mediums of watercolor, oil, and acrylic. The only difference is that pastel is a dry application. Pastel was first popularized through the 18th and 19th Century paintings of Rosalba Carriera, Maurice Quentin de La Tour, Odilon Redon, Edward Degas and Mary Cassett. Pastel fell out of favor with galleries and museums as a fine art form for much of the 20th Century. The 1970s saw a resurgence in popularity of the medium, generated primarily by a manufacturing renaissance in the availability of new brands of pastel and specially prepared pastel papers. In subsequent years soft pastel paintings have regained their prestigious footing and are now regarded as a fine art form equal to that of any other medium. In my own experience working with pastel, there is a particular tactile pleasurable intimacy that cannot be derived from any other medium. Each stroke upon the paper is an unique expression giving way to a variety of sensations. Even the swishing, scratching sounds made by pastel upon sanded paper provides me with a particular aesthetic satisfaction that cannot be duplicated using wet mediums. I find the immediacy of touch that comes from not using a brush or other implement especially gratifying as an artist. In my paintings I incorporate a wide variety of pastel brands including, Mt. Vision, Sennelier, Unison, Terry Ludwig, Girault, and Schmincke. Likewise with my paper supports,, where my current favorites are Art Spectrum Colorfix and Wallis. I do not use fixative for finishing my work as it tends to dull and darken color. Therefore, it is unwise to jostle the painting too much, although some pastel residue on the matt overtime is unavoidable and can be viewed in the pastel works of Degas.